Coming Soon from the Emerging Civil War Series: Strike Them a Blow! The roll-out continues for the Emerging Civil War Series’s upcoming book titles. So far, we focused on the end of the war in 1865. 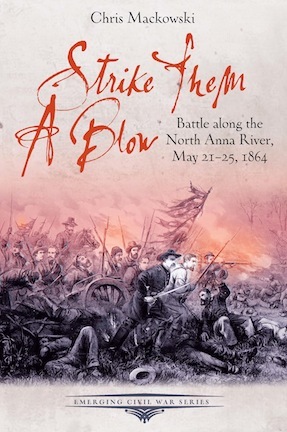 But another title we’re looking forward to fills in a gap in our library: Strike Them a Blow: Battle Along the North Anna River, May 21-25, 1864 by Chris Mackowski. Strike Them a Blow picks up where A Season of Slaughter: The Battle of Spotsylvania Court House leaves off, and it serves as the perfect lead-in to Hurricane from the Heavens: The Battle of Cold Harbor. Season, co-authored by Mackowski and Kristopher, and Hurricane, co-authored by Dan Davis and Phill Greenwalt, have been two of the most popular titles in the Emerging Civil War Series. But Grant’s war of attrition began to take its toll in a more insidious way, as well. Both army commanders—operating on the dark edge of exhaustion, fighting off illness, pressure-cooked by stress—began to feel the effects of that continuous, merciless grind in very personal ways. Punch-drunk tired, they began to second-guess themselves, began missing opportunities, began making mistakes. As a result, along the banks of the North Anna River, commanders on both sides brought their armies to the brink of destruction without even knowing it. Picking up the story he began in his Emerging Civil War Series book A Season of Slaughter: The Battle of Spotsylvania Courthouse, historian Chris Mackowski follows the road south to the North Anna River. Strike Them a Blow: Battle Along the North Anna offers a concise, engaging account of the mistakes and missed opportunities of the third—and least understood—phase of the Overland Campaign. Chris Mackowski, Ph.D., is co-founder and editor-in-chief of Emerging Civil War. He has authored or co-authored a dozen books on the Civil War, and his work has appeared in Civil War Times, America’s Civil War, Hallowed Ground, and Blue & Gray. Chris is a professor of journalism and mass communication at St. Bonaventure University in Allegany, NY, and historian-in-residence at Stevenson Ridge, a historic property on the Spotsylvania battlefield. He also works Fredericksburg and Spotsylvania National Military Park. This entry was posted in Books & Authors, Emerging Civil War Series and tagged Civil War Trust, Emerging Civil War Series, Hurricane from the Heavens, Jericho Mills, North Anna, North Anna River, Overland Campaign, Season of Slaughter, strike-them-a-blow. Bookmark the permalink. 1 Response to Coming Soon from the Emerging Civil War Series: Strike Them a Blow!